One of the services Mountain Crossings is most known for is the Shakedown. A shakedown is a one on one session with an experienced backpacker from our staff in which we go through the contents of your pack and see where some changes could be made in order to cut down on weight. Over packing and carrying far too heavy of a pack is a common mistake of beginner backpackers. 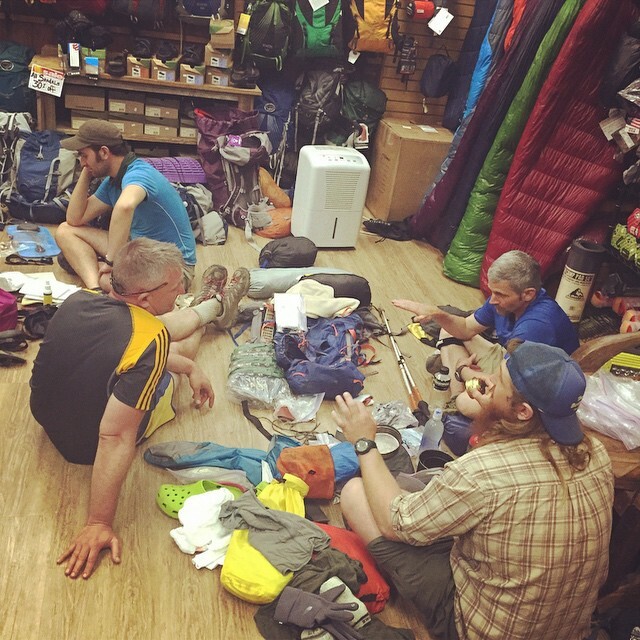 During the peak times of thru hiker season, we do so many shakedowns in a day that we easily loose count and many times have several employees paired up with several customers all working at one time. It is an excellent way for us to spend quality time with customers and also offer valuable information about a topic we love and hope to help others fall in love with as well. Hiker Trash Creativity at its finest. 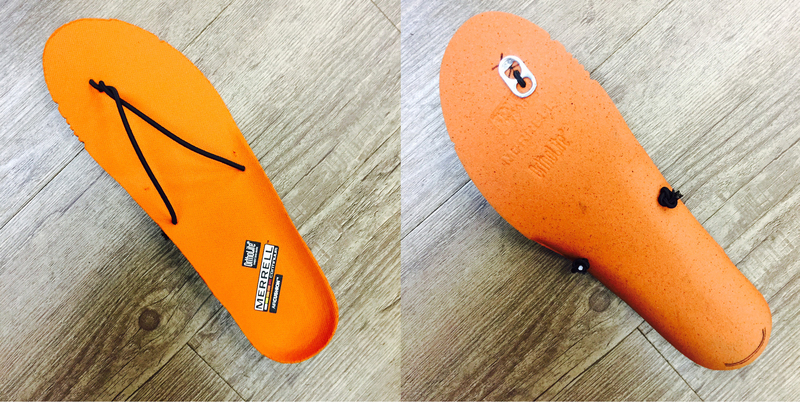 These camp shoes cost next to nothing to make and are the lightest weight pair of shoes you can find. All you need is a pair of insoles (use the soles that come in your boots or trail runners and replace them with SuperFeet), a soda can tab and a small amount of cord. Going ultralight or even just lightening up enough to make a substantial difference can require a lot of creativity. You have to see things for what they are not. Disposable plastic water bottles, particularly Gatorade and Smart Water bottles, make excellent, light weight alternatives to heavy Nalgene bottles. We are so used to thinking of gear in terms of long lasting quality but these bottles are so cheap and readily available that it is worth re-buying them a few times along the trail. Trash compactor bags are another “piece of trash” that makes an excellent waterproof bag for storing your sleeping bag or even lining an entire pack. If you are working with an smaller capacity pack, you can always rig up a little more storage space by attaching shock cord to the exterior of the pack and latching a sleeping pad or sleeping bag on the outside of the pack. Small, cheap additions like these are the starting point for creative backpacking. 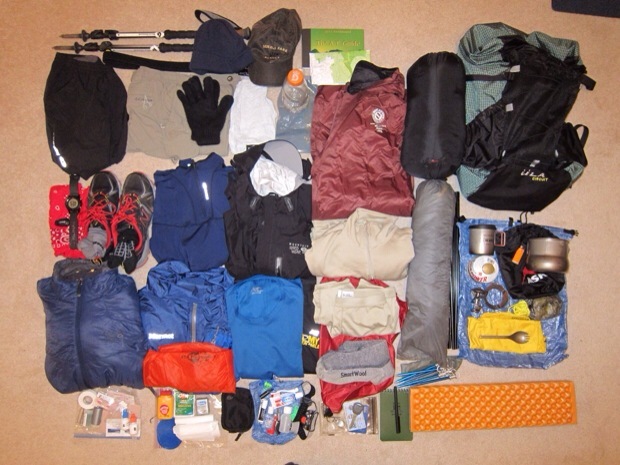 Example of a solid gear set up for an Appalachian Trail thru hike. The end all be all tactic for a lighter pack is doing with out. There is no need to suffer in discomfort, but there is a definite need for simplifying your life while backpacking. A packet of instant coffee will suffice up against the weight of ground coffee, filters and a brewing system. A single extra change of clothes is all you need once you’ve got your weather appropriate clothing down pat. Cutting out heavy technology items like tablets, e-readers and bulky cameras will lighten your load significantly. Each person decides what they deem worthy to carry while hiking, but at a certain point, sacrifices always need to be made for a lighter pack weight. Multiple shakedowns going on during peak thru hiker season! Mountain Crossings offers shakedowns to hikers year round. 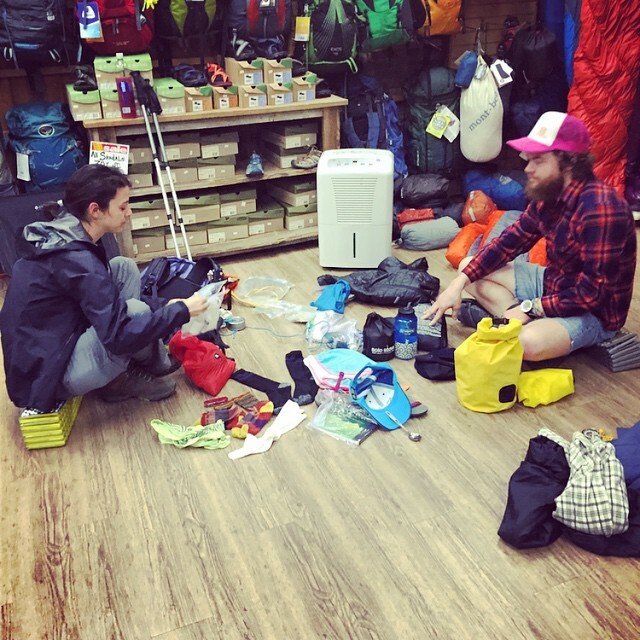 Always feel free to stop by for some free advice about backpacking and your particular gear set up. This entry was tagged appalachian Trail, backpacking, gear, hiking, lightweight, Shakedown, thru hiking, ultralight. Bookmark the permalink.